At this point in the zombie mythology, there’s not much more a filmmaker can do. We’ve had the old fashioned voodoo version that made the horror films of the ’30s and ’40s quite laughable. Then there was the slow walking menace of the whole Night/Dawn/Day of the Dead ideal. Amped up when the Romero remake came along, we now have flesh eaters who sprint faster than most Olympians and attack like rhinoceroses with rabies. Within all of these parameters are various plausible permutations–comedy and social commentary, satire and straight ahead splatter. 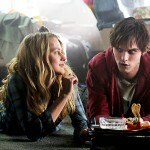 Now we can add romance to the mix, turning the entire “ZomCom” subgenre into the more difficult to achieve “RomZomCom.” Luckily, Warm Bodies makes the best use of the various scary movie archetypes available, turning a potential problem into one of the surprise delights of this or any pre-summer season. 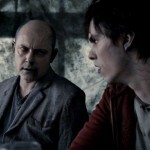 R (Nicholas Hoult) is a zombie living in an abandoned airplane near a fortified city. He spends his days lumbering around, recalling vague memories of being human and hanging with buddies like M (Rob Corddry). Occasionally, these misfit monsters head to populated areas, hoping to discover some food. During one trip, R attacks and eats the brains of a boy named Perry (Dave Franco). At the same time, he falls for the victim’s girlfriend, Julie (Teresa Palmer). After an uneasy few hours together, they form an unlikely bond. Of course, there are elements out to keep them apart. First, there are the horrible “bonies” — zombies that have rotted away to the point of skeletal brutality. Then there is Julie’s military-minded father (John Malkovich) who views the entire zombie problem in both survival and slightly racist terms. With R becoming more and more human, it’s clear a standoff is in the making. Will the humans learn to accept him, and if not, what about his relationship with Julie? As a combination of several seemingly incongruous elements, Warm Bodies is a marvel. It works when it shouldn’t, playing with the parameters of all three concepts that it is dealing in (horror, humor, and heart) with style and skill. Filmmaker Jonathan Levine, perhaps best known for The Wackness and the cancer comedy 50/50, does a terrific job of making the illogical and implausible seem real. He messes with zombie mythology just enough to provide both hope (apparently, the plague is reversible) and hideousness (those Harryhausen homages known as “bonies”). Anchored by a terrific performance from Hoult (who has come a long way since playing Hugh Grant’s “problem” in About a Boy) and equally compelling work from the rest of the cast, Warm Bodies illustrates how smart writing and the proper approach can overcome even the most mixed up narrative notions. We grow to love R, hope that Julie starts to feel the same, and lose all hate for the creatures when their much worse offspring turn up to terrorize. By the end, we want our hero to succeed, to “come back from the dead,” so to speak. Unlike the typical romantic comedy which inserts high-concept crap into the mix to turn our paramours into pratfalls, Warm Bodies finds a way to invest its conceptual quirk with something meaningful. It may be no more than a post-modern update on Beauty and the Beast, but in its success we can see a whole new way of turning the walking dead into something beyond the scary. Blu-ray extras include numerous making-of featurettes, commentary track, deleted scenes, and a gag reel. Are you people not mentioning Romeo and Juliet to avoid spoilers? Are you freakkkkking kidding? When she came out to the balcony?? Do people even go to high school anymore??!!! R AND JULIE!!! I really hope you mentioned “Beauty and the Beast” deliberately to avoid Romeo and Juliet spoilers. ARE YOU F WORD ING BRAINDEAD. !